The Cosmo series has convincing style, functionality and compactness. It adapts well to personal furnishing styles and ideas. The case made from max. 8mm cast aluminum is very durable and due to its weight the machine can be easily operated by means of a foot sensor. A high dead weight guarantees stability. Easy Comfort, small, light & user friendly, equipped with two polishing & a nylon Pre-cleaning brushes provide a quick & efficient cleaning & polishing of any shoe. Ronda 30 Standard presents itself as a real classic among shoe shine machines. A puristic design, a powerful motor and excellent value for money are the key characteristics of this model while it still does not require too much space. 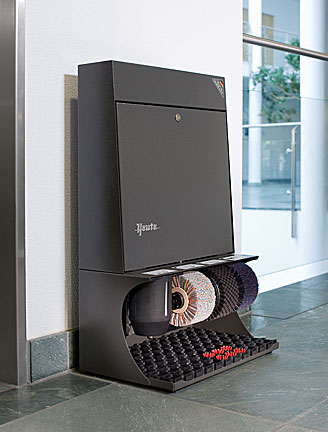 Boarding houses, hotels and office and administration buildings are places where this machine is at home. 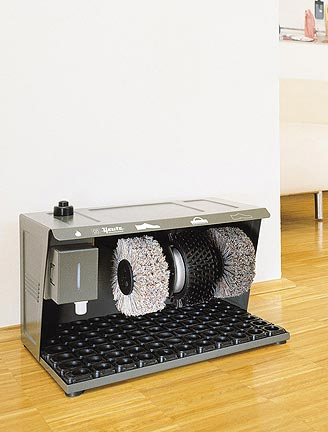 This Cleaning unit is designed with four brushes, which are counter rotating and clean the soles from underneath. Two lateral disk brushes clean edges of the soles. Brushed off dirt falls into a large drawer at the broom of the device. This drawer can be removed and cleaned easily. 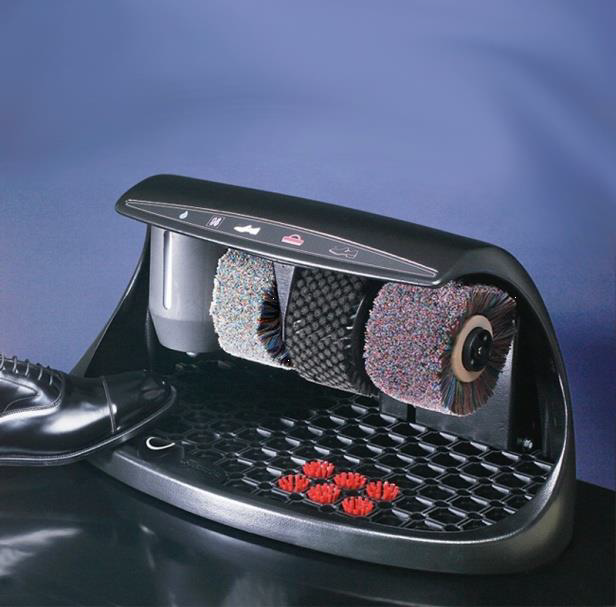 Four wheel brushes clean the soles and two lateral disk brushes clean the edges of the shoes, while the uppers are cleaned by a third brush. Brushed-off dirt falls into a large drawer. A belt gear ensures powerful brushing while running smoothly at the same time. 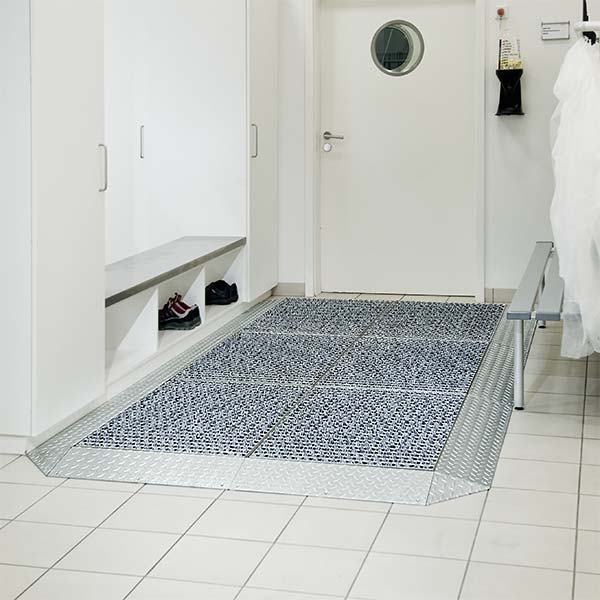 The stainless steel StepGate personal locks are particularly suitable for access to sensitive production areas.It is suitable for less frequented side entrances up to 30 people a day. When walking, the soles are mechanically and wet cleaned by diagonally arranged patented brush strips. By adding disinfectants and / or cleaning agents, the cleaning process is chemically supported. 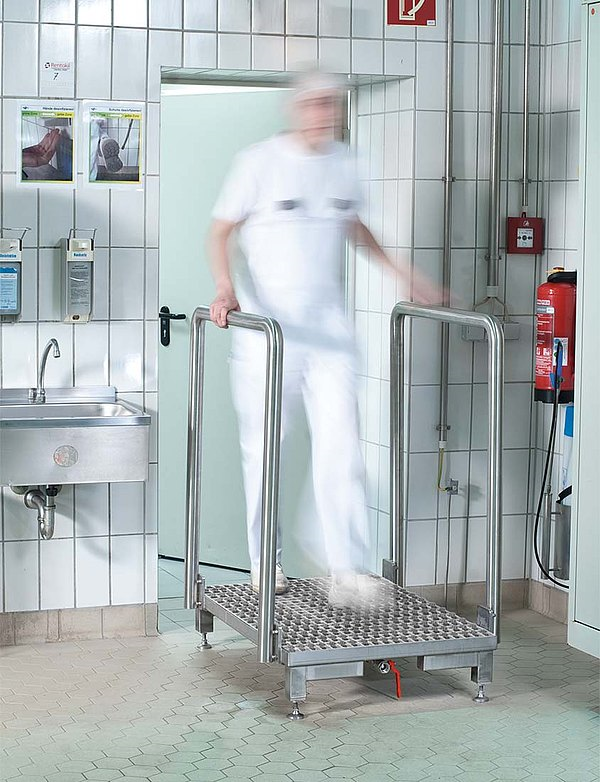 The level of the level of cleaning fluid in the VA sub-tub determines the intensity of the cleaning. 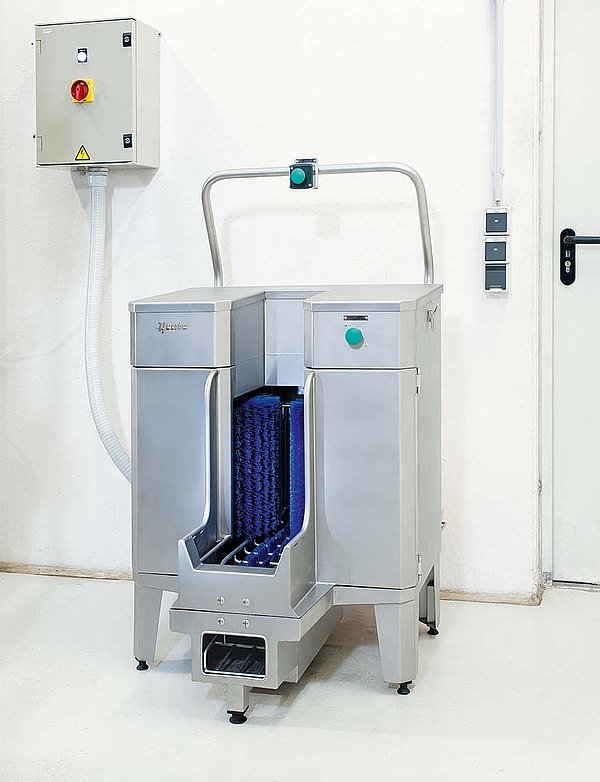 With ProfilGate go up to 90% of the dirt adhering to soles and castors can be removed just prior to drainage.It was specially developed for active shoe sole cleaning in industrial environments. The ProfilGate grates can be easily removed and cleaned. The long bristles also clean working shoes with a coarse profile very reliably. 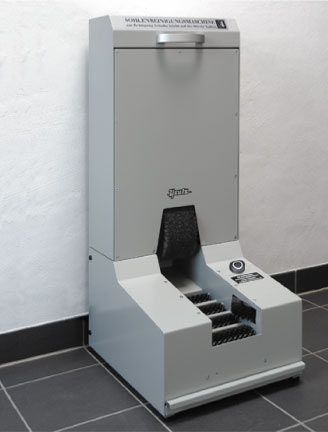 Upon entering the cleaning field, the sloping bristles dip and actively rub the soles clean. In the case of ground-level installation, the use of pallet trucks or other transport vehicles is also possible. The black and white bristles blend in with any environment neutral. Cleaning both the sole and entire boot, the universal machine Neptun BC1 (Boot Cleaner 1) solves any problem with dirt. It is efficient and quick in washing of both the sole, uppers and bootlegs of work boots and shoes separately from each other. The two vertical roller nylon brushes clean the bootlegs intensively. While the lower horizontal brush provides for perfect finish of the sole. 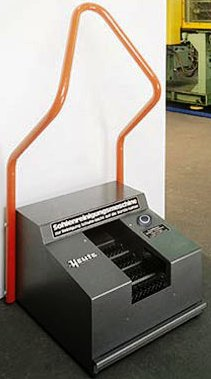 For pure sole cleaning on clogs and low shoes, the lower revolving brush can also be started and operated individually. A quick release permits complete swing-up the stainless steel front section enabling fast and easy cleaning of the machine. Extremely effective for very dirty shoes and boots. Machine can be cleaned fast and easily.